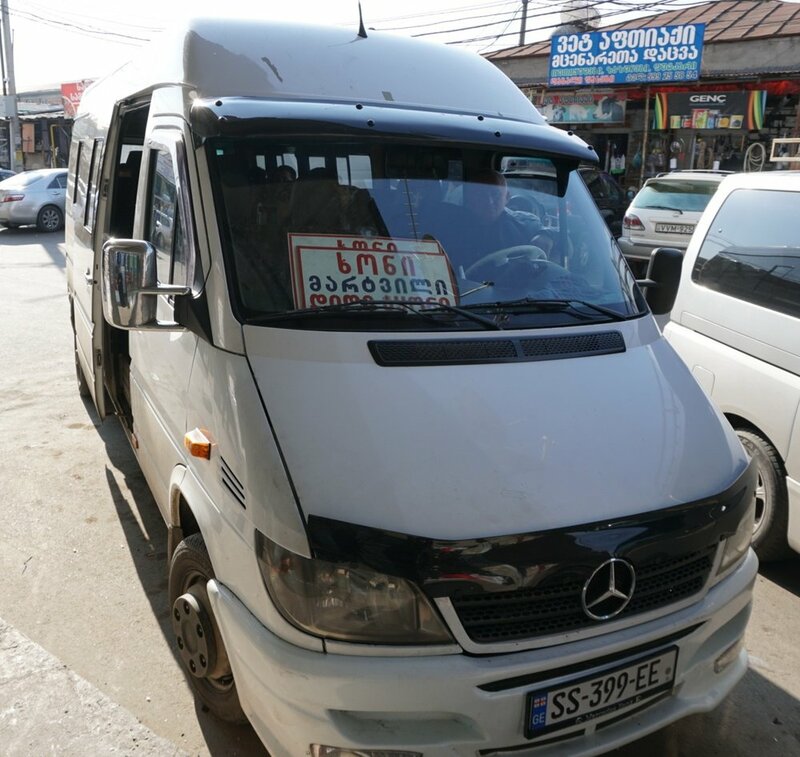 On a minibus trip out of Tbilisi—into the hills above Zestaponi in Western Georgia—I found myself squashed next to a rotund man, my knees pressed into the hard plastic backing of the chair in front of me, my shoulders awkwardly tilted so that I could rest my head on the ice-cold window and drift into semi-consciousness, never actually falling asleep. I loved it. Hate-loved, I should say, which is my general feeling about long rides in marshrutkas. That’s what they call minibuses here, and they’re ubiquitous. In cities they’re a private share-taxi service. In rural areas they’re the link for anyone without a car to the wider world. They function on a simple logic: run in a straight line between two places, stopping whenever a passenger asks and picking up anyone who hails them down. In the Middle East they’re called sharut, and versions of them appear all over the world. It’s the cheapest and most straightforward way to get anywhere in Georgia. So getting out into the villages requires at least one marshrutka ride (if I’m lucky). Over a three-day research trip into Western Georgia I’ve calculated that I spent about twelve cumulative hours in them. I learned a few things in that time. The first lesson: no two marshrutkas are alike. Though usually a Ford Transit or a Mercedes Sprinter, each minibus has been modified in its own way. Some have a handrail for when, inevitably, people have to ride standing, some have folding mini-seats that fill the aisle to cram in a few extra passengers, some even have TV screens, blaring extremely sexual Russian pop music videos at three in the afternoon to an audience of largely over-fifty, disinterested passengers. The only constant between them: legroom is allocated for someone around five feet tall. Any taller and you can kiss your knees goodbye. The second lesson: they never go the speed you want. There are two options for marshrutka drivers, snail’s pace or breakneck. They tend to crawl as they troll for new passengers or on the few straight stretches of road when picking up a few clicks might be appreciated by the passengers. They reserve breakneck for hairpin turns, poorly-maintained roads, and blind overtakes on a bend. The third lesson: abandon personal space, all ye who enter here. You’d think the legroom design reflected a generally shorter, smaller population. That is in no way the case. At 5’11” I’m around average for men on the marshrutka, and I’m significantly narrower (not a flex). I couldn’t tell you how many times I’ve had a large leather-jacket clad man smelling faintly of pork fat quite literally spilling himself onto my thigh—I would like that sentence taken out of context and attributed to me one day. The fourth lesson: don’t try to make this easier. In the brutal heat of summer, you’d better not try and make things more comfortable by cracking a window. The entire marshrutka knows, with certainty, that a draft will make you sick. Though, they’re happy to ask the driver to pull over so they can pick up some unrefrigerated pork that’s been hanging on the roadside all day. In winter, and it doesn’t get that cold here, the driver will be blasting screaming hot air directly in your face. A request to turn it down will be ignored outright. So why do I love these rides? It’s not because of any kind of masochism on my part, I promise. One reason, I think, is that after a while I find myself entering a kind of zen state. Semi-conscious, my reality narrows to the confines of the mini-bus and whatever podcast I’ve had the foresight to download. Anxiety about life choices melts away behind the more present fear that we’ll careen off a cliff at the next turn. The other passengers are kind, too. They’ll chat with one another or ask me where I’m from. I’ve been saved on more than one occasion from missing my stop by a thoughtful neighbour, something about our extreme proximity must have bonded us. There’s an amazing culture to them, too. In the more rural routes the marshrutka functions as a school bus, dropping kids right at their parents’ gates, the driver sending his regards with the kids to their folks. They can be goods transporters, drivers pulling over at a crossroads to hand a crate of cabbages to another marshrutka or handing unmarked plastic bags to men standing at a village roadside. I didn’t ask what was inside. Sometimes at stops, people seem to board almost at random. What looked like an ordinary man doing his shopping in the village centre, suddenly turns into a passenger making a three hour trip into the city, as though on a whim. So, if you find yourself in Georgia and somebody tells you the best way to get somewhere is by marshrutka, don’t fear. It’s a learning experience. Though maybe you’ll just learn that you never want to ride in one again.